This CD opens with Samuel Barber’s fine String Quartet. This work is ‘famous’ for being the source of the pot-boiler ‘Adagio’ for Strings. Certainly this middle movement is one of the most profound examples of the art of the string quartet in any generation. The outer movements were always going to be in the shadow of this concentration of feeling; the very short ‘molto allegro’ which concludes the work is impressive in so far as it presents a foil to the ‘adagio.’ The quartet is cyclic with references to the opening ‘molto allegro e appassionato’. This opening movement begins with a strong statement which is balanced by a further two themes: one almost hymn-like and the other reflective and full of longing. The work was written whilst Samuel Barber was living in Austria with his partner Gian Carlo Menotti. 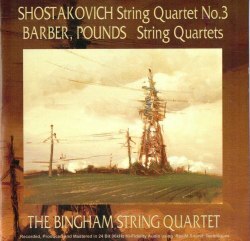 Dmitri Shostakovich’s String Quartet No. 3, Op. 73 was composed in 1946 shortly after his Ninth Symphony which had been proscribed by the Soviet authorities. The quartet was premiered in Moscow the same year by the Beethoven Quartet. This is a major work lasting for more than half and hour. It is unusual in that it has five movements. These movements were given rather trite titles to convince the Soviet censors that this work was not ‘elitist or abstract’. For example the first was labelled ‘Blithe ignorance of the future cataclysm’ and the last, ‘The eternal question: Why? And for what?’ It was a sorry reflection on the artistic mores of that particular political regime that such a conceit was required. However, the listener is entirely free - and strongly advised - to dump this ‘programme’: the composer did before the quartet was published. It is best to listen to this work as any other ‘absolute’ music. It’s an approachable work that, like much of Shostakovich’s music, represents a balance between his struggle against tyranny and his deep, personal emotional experiences. This approachability does not mean that the work is in any way easy to assimilate. There is a remarkable amount of interest in this quartet. As well as passages of beauty there are intimations of sheer naked aggression. As a piece of music, I find it difficult to come to terms with the cynicism and the sarcasm that are ever-present features of this Quartet. However, that is to reflect on the inherent strength of the work: not to be a criticism. British music enthusiasts will be impressed by the String Quartet No. 2 by Adam Pounds. This fifteen minute work is composed in a single movement. It was written in 2003, a quarter of a century after his first example. The opening tends to fall into the so-called ‘pastoral’ school - but this is most likely because the composer has written a ‘modal’ tune that works well as a contrapuntal theme rather than any attempt at creating a particular ‘landscape’. This mood is not maintained for long. There are plenty of diverse moments that move this work away from any simplistic ‘rustic’ style. Some of this development is aggressive before returning to the more reflective opening themes. There is a continual tension between the disturbed and the reflective. The final mood is one of repose and resignation. For me it is the most enjoyable work on this CD. I enjoyed the performance of these three works and felt that the Bingham Quartet was completely committed and competent. Nevertheless, there a downside: the liner notes and CD case. The text is in a small font, in a yellowy colour, printed on a brown photographic background. It is, quite frankly illegible. I felt a little more information could have been given about the Pounds’ work as this is most likely to be a new piece to most listeners. There are some photos of the performance and recording sessions which are presented in ‘nostalgic’ sepia. They are not clear and are largely unhelpful. On the ‘up’ side, this is a well-balanced recital with a convincing programme. I would not wish to suggest that Pounds’ Quartet is in any way beholden to Shostakovich or Barber, but there is a clear continuity of mood between the three works. This CD is a good investment for any string quartet enthusiast. Listeners who appreciate fresh, traditionally-sounding music that is always interesting and challenging will especially require this disc for Adam Pounds’ String Quartet.